It was a friends birthday recently and I couldn't resist using our Over the Hill saying. To make this card I cut out a piece of card 1 cm smaller than A5, and attached some backing paper to the bottom half of it. 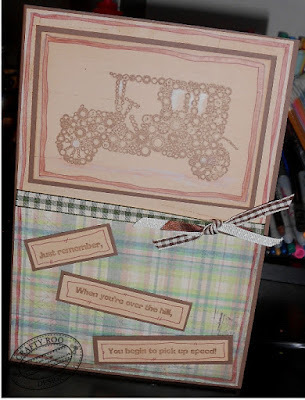 On the top part I added sketch marks and distressed around the whole piece of card. Next I doodled a frame and coloured it in. Across the centre of the card I attached some ribbons and knotted them. this was then mounted onto a dark A5 card. Next onto the same coloured card as the backing card, I stamped Jalopy and cut it out leaving about 1cm all around the image and added a frame as before. This image was then mounted onto darker card and attached centrally to the top of the card. 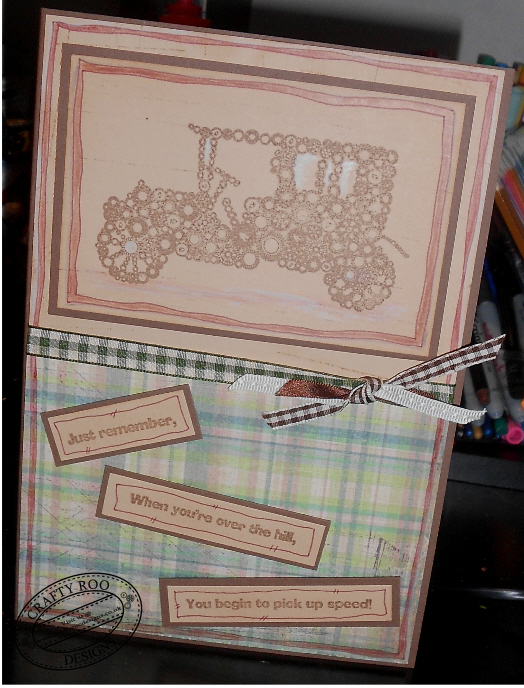 To finish of the card I stamped the Over the Hill saying trimmed it down and doodled around the saying. This was then mounted onto the darker card and trimmed down. Finally this was attached to the bottom of the card.